With the fifth largest economy in the world and nearly 40 million residents, California’s policies often have rippling effects far beyond its state borders, especially in the realms of environment, energy, and technology. So what’s it like being an ecologist-turned-policy staffer wading into the dynamic ecosystem that is the California state government? If you’re a researcher or graduate student registered to attend the Ecological Society of America 2018 Annual Meeting this August in New Orleans, you’re in luck! 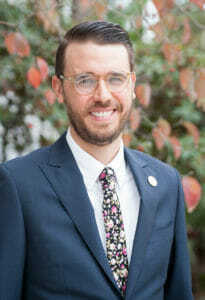 Dylan Chapple PhD, a member of our 2018 Class of CCST Science & Technology Policy Fellows, will share insights about our program during the Wednesday session on science policy fellowships and careers. A salt marsh ecology specialist, Dylan received a PhD in Environmental Science, Policy and Management from UC Berkeley, a BA in Environmental Studies at UC Santa Cruz. As a CCST Science Fellow, Dylan was placed with the California State Assembly Committee on Natural Resources and Assemblymember Al Muratsuchi (D-Torrance), Acting Committee Chair. Dylan is the latest of many scientists with ecology training who have joined our CCST Science Fellows program — following others like Mike Peterson ’17, Dan Brumbaugh ’16, Angee Doerr ’15, Alexis Irwin ’14, Laura Feinstein ’13, and Igor Laćan ’10. If a year of public service and government leadership training inside the California State Legislature sounds like the perfect career growth adventure for you, come meet Dylan at #ESA2018! 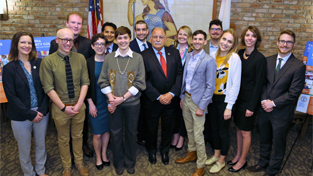 And read Dylan Chapple’s recent training diary (“Finding My Place in the Diverse Dynamism of California Policy”); Mike Peterson’s year in review (“The 2017 Fellowship Year: Minutes, Moments, and Memories”); Dan Brumbaugh’s oceanic musings; and Commander Angee Doerr’s “Fellows Profile” for a closer look at the life as a CCST Science Fellow in the California State Capitol! 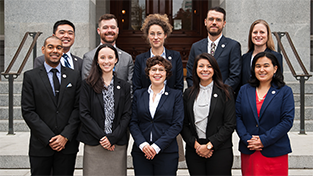 The CCST Science & Technology Policy Fellowship trains scientific thinkers to be policy-savvy, while helping equip California’s lawmakers with science-savvy staff. Follow updates from the CCST Science Fellows on Facebook at facebook.com/ccstfellows and on Twitter @CCSTFellows. Explore the CCST Science & Technology Policy Fellowship at fellows.ccst.us. The California Council on Science and Technology is a nonpartisan, nonprofit organization established via the California State Legislature in 1988. CCST engages leading experts in science and technology to advise state policymakers ― ensuring that California policy is strengthened and informed by scientific knowledge, research, and innovation. Find CCST on Facebook at facebook.com/ccstorg, on Twitter @CCSTorg, and on LinkedIn. 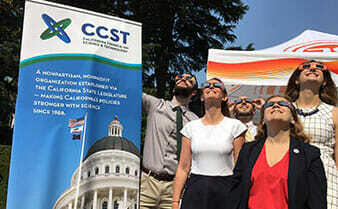 Discover how CCST makes California’s policies stronger with science at www.ccst.us, and join us in celebrating #CCST30th.